Only one more day to go !!! This time tomorrow I should be holed up in a Luton Travel lodge, fast asleep, ready for the flight at 8.00 a.m. Monday morning to Romania. Getting excited. Been learning my Romanian this week. Here is the first line of the sermon I should be preaching on Sunday 7th June. Buna ziua, mai dragostea de Domnul nostru Iisus Hristos sa te binecuvânteze astazi. Impressed ??? Heres hoping I can get the pronunciation right !! Frantically packing and getting ready for Romanian trip on Monday. Only allowed 20 kilos in suitcase and 10 in handluggage, and so it becomes a tight squeeze trying to fit all the paper, pencils, toys and gifts in, and yet leave room for more than one t~shirt !! Holiday club is going to be based around an olympic theme so everything is Biblically based around teaching of running the race for Christ. Should be good. At least all this is helping me get over Newcastle’s relegation into the Championship. Alison, Ellie, Fran, Karen, Scott, Phil, Antony and myself. Please also pray for the people of Poiana that we may be used by the Lord for their benefit. 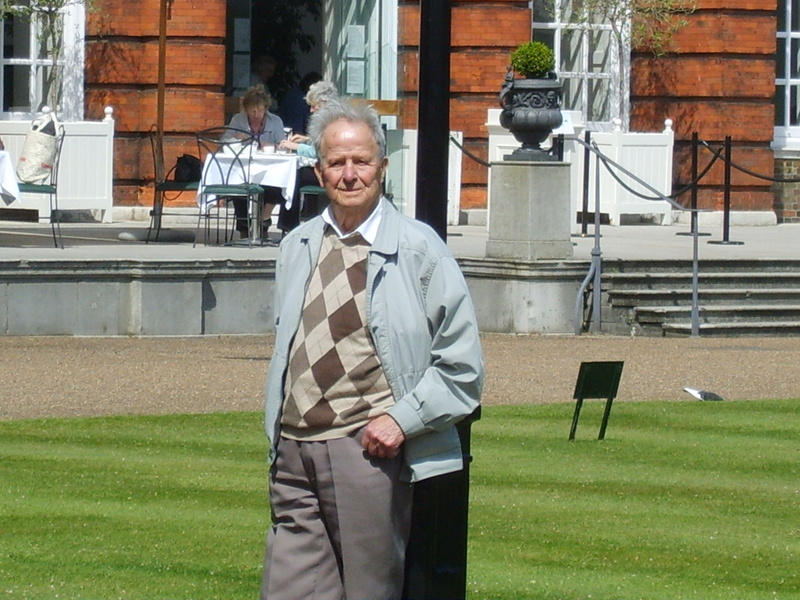 As I said a couple of days ago I had the privilege of taking Dad to Kensington Palace for a tour and afternoon tea in the Orangery, last week. Two things came out of the day which I have reflected on since. Firstly, the tea in the Orangery which consisted of a cream cheese and cucumber sandwich. It was cut into triangles (4) without crusts; ever so dainty. This single sandwich was followed by a scone with jam and cream, a cup of cappuccino and a wedge of Victoria sponge cake. Now, don’t get me wrong, but to a simple country lad from the backwaters of the North East it seemed very little for a disproportionately high price. The omelette and chips we had in the evening was much better value ! The second thing to come out of the day, was how pleasurable it was to spend it with my Father. Just Dad and I chatting, enjoying things together, having a pint in the pub, getting the train home was particularly memorable for me. Why has this gone round and round in my mind since ? Well it seems to me that in life we often get things the wrong way round. We pay extraordinary prices for things which are transient and don’t give full satisfaction. The tea in the Orangery did not add very much to the day and in life we fill ourselves with things that don’t improve our lives very much at all. We fill our lives with all sorts of junk and rubbish, cramming in all sorts of fleetingly hedonistic things believing that the latest gadget or fashion will improve the quality of our lives when it will only ever be a brief time filler till the next thrill comes along. Instead we should be seeking to find satisfaction in the things that really matter, relationships. Friends, families, people we meet casually at times are all important in our life’s journey and people cannot be replaced by trends or fashions. Indeed the greatest relationship of them all is often the one most neglected by us; the relationship we can have with God the Father through Jesus Christ our Lord. 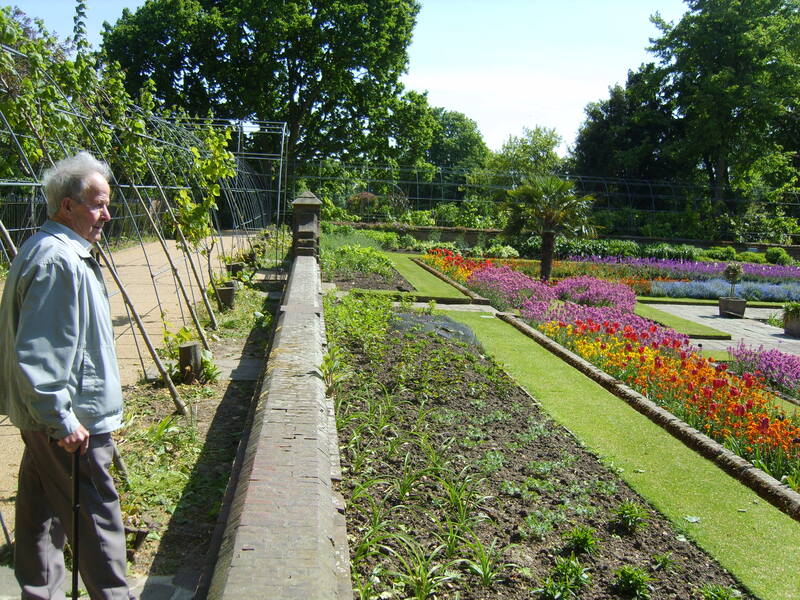 Just as I will treasure the time I spent with my Dad in London, so we should treasure being in our heavenly Fathers presence whether that be in Church, in the garden, in the work place, or wherever. We should seek his presence and then simply enjoy it without letting the hustle and bustle of the world crowd that special moment out. I urge each one of us to find at least a moment in each day to stop and enjoy the presence of God, our Heavenly Father. Please continue to pray for the people of Ripley Methodist Church as their building project continues. The old Chapel and school room is now completely down, and building work on the new structure begins next week. Although folk are excited about the new building there is still, understandably, sadness over the loss of the old which has served us well. Great night tonight at Swanwick Churches Together Barn Dance. Good food (pie and peas), good company, some nifty footwork (but not from me) and lots of laughter; this was just the tonic I needed after a bad day with Newcastle United. Its been quite a week. I feel as though I’ve hob~nobbed with the great and good this week. Last Saturday night my colleague, Alison, and I were guests of honour at the civic dinner for Lynne, the mayor of Ripley town council. It was a very enjoyable evening at Kilburn Hall in the home of Lord and Lady Fenton who were delightful hosts. Good food, good company and a pleasant time listening to Lady Fenton’s delightful tales of theatre life made it all a special and memorable time. Then on Monday Dad and I travelled to London to visit Kensington Palace. 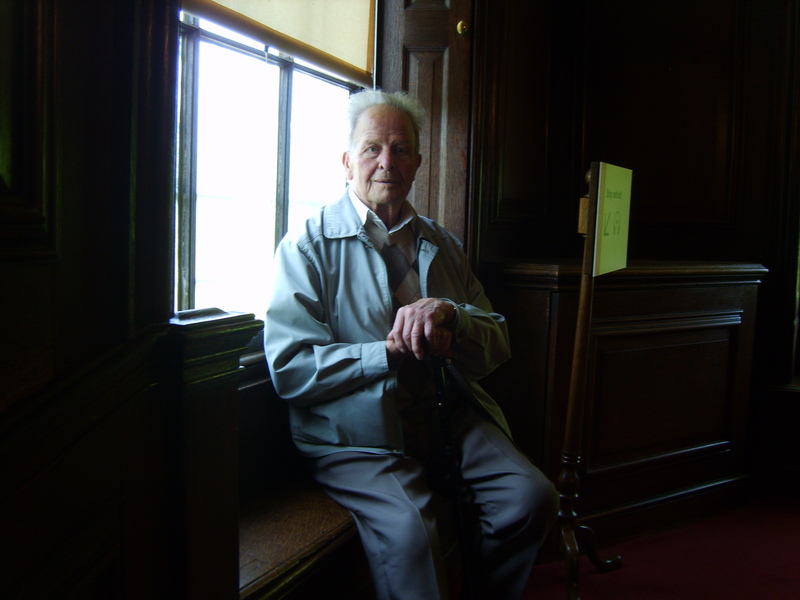 Dad was 80 years old last September and Alison and I decided to do something different so we booked a tour of Kensington Palace plus afternoon tea in the Orangery. It then took us almost 8 months to get him there ! Still, it was worth the wait; travelling down by train we hit on a lovely sunny day. 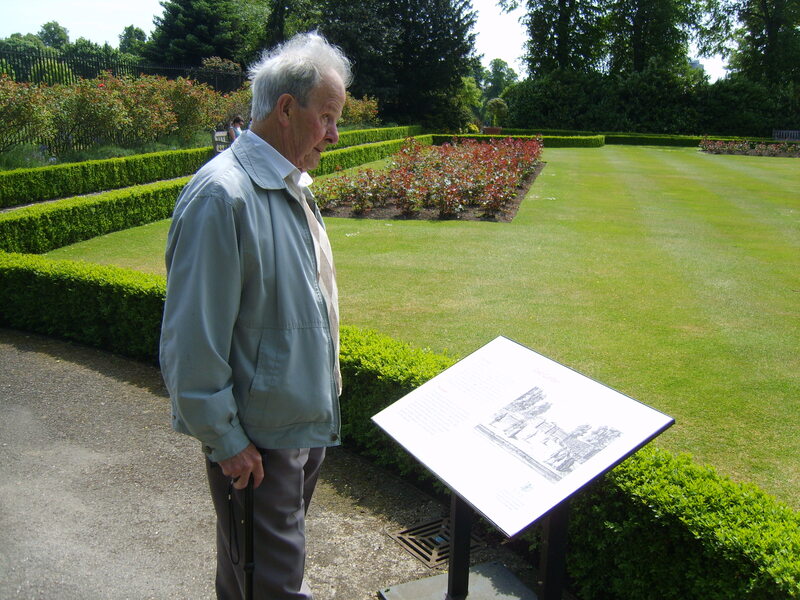 The grounds were lovely, the house fascinating and I think that Dad really enjoyed himself. The tea in the Orangery was special too (if above our normal price range); cucumber and cream cheese sandwiches, followed by jam and cream with scone, and concluded with Victoria sponge cake. In addition with a delicious cappuccino it was very special. It made for a very pleasant afternoon but what was best of all for me was simply spending time with Dad and enjoying his company. I’ve no shame in telling people that he is my hero and so it was lovely just to be with him. This year Kensington, next year Buckingham ?? ?